Must present coupon at the time services are rendered to take advantage of special offer. Boynton Beach Dentist: Patient – Julianne L.
Julianne L., is a “50 something” female engineer, who is employed at a local quasi-public utility. She has been a patient of record for some time. 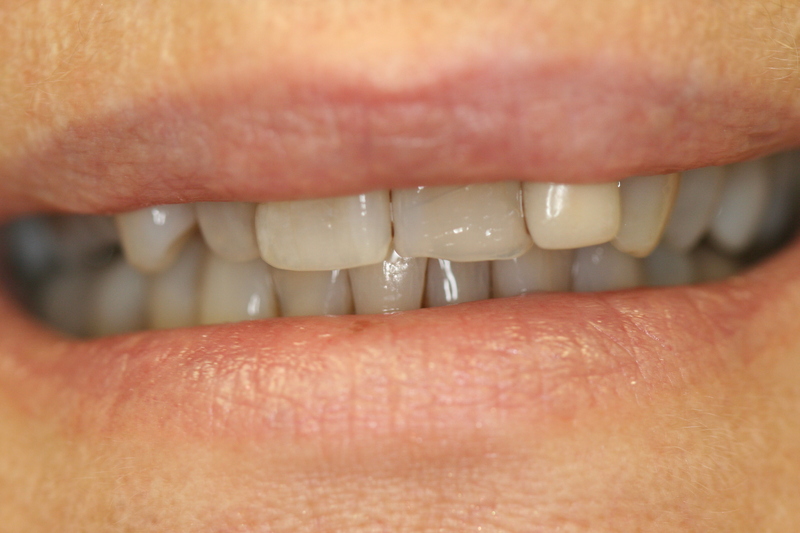 She had implant fixtures placed in the upper right and left posterior, as well as the lower left posterior. 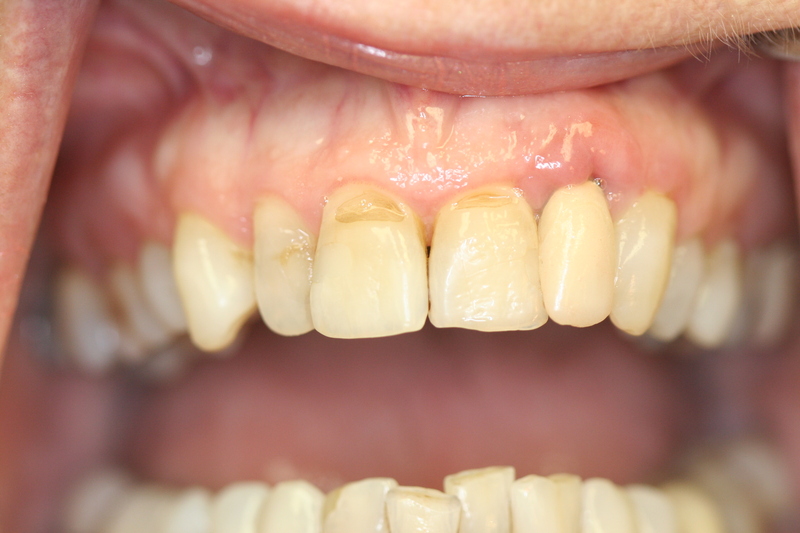 It is evident from the photographs below, however, that the lower arch reflects badly worn teeth in need of reconstruction. 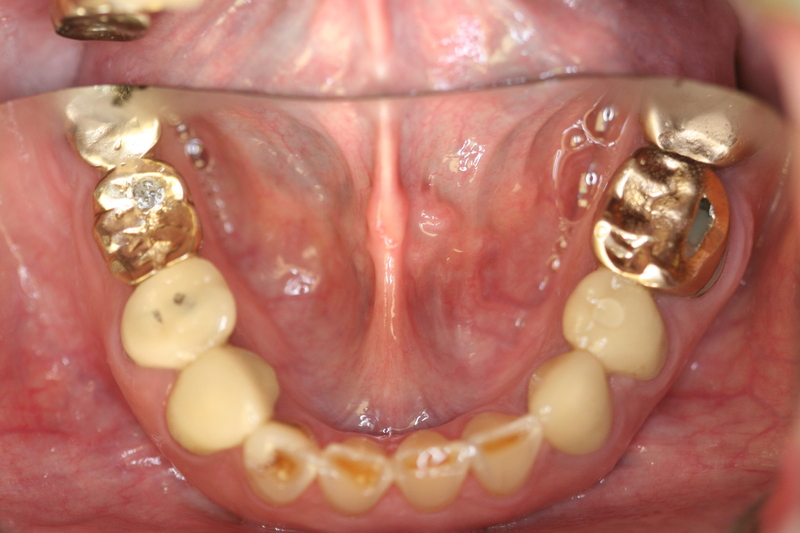 After careful evaluation and review, it was determined that the best course of action was to replace all the crowns in the lower arch at a new increased height to compensate for the worn tooth structure. 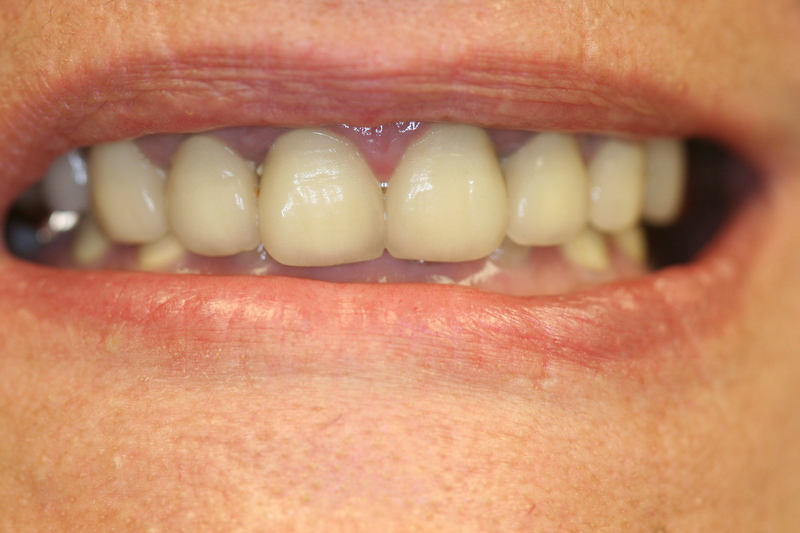 The lower incisors were prepared for all Porcelain Jacket Crowns. 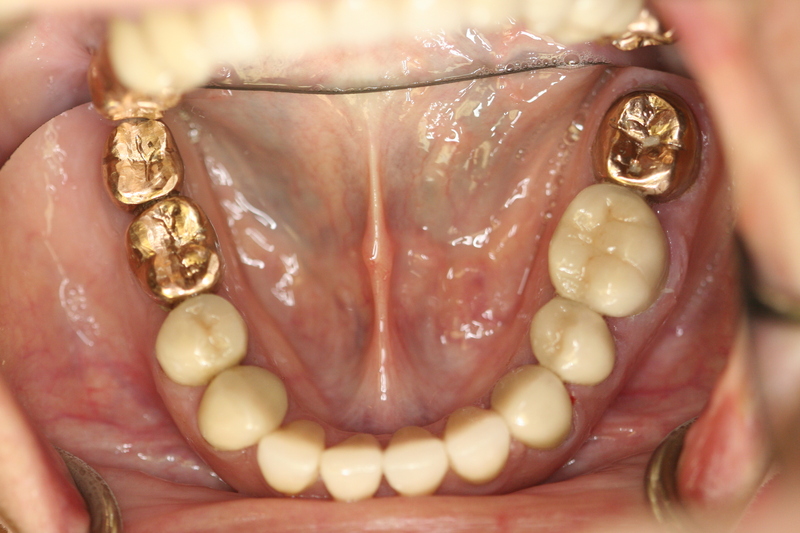 The full cast gold crowns in the lower arch match complementary full cast gold crowns in the upper arch. The completed case is found in the photographs below. 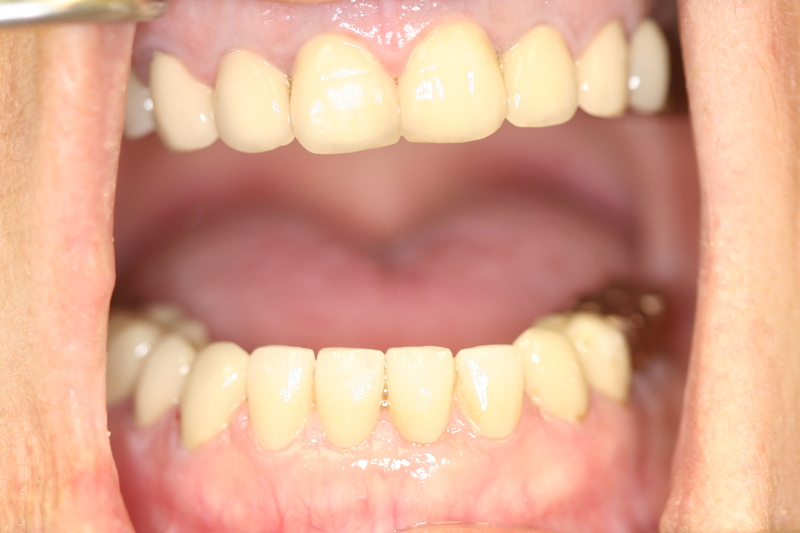 If you would like to discuss the foregoing case or any other case posted here on the eastboyntondental.com website, please feel free to contact us. Our staff is always willing to listen to you. This 60+ year old female former bank exec, had presented to our office for routine care, for a few years. 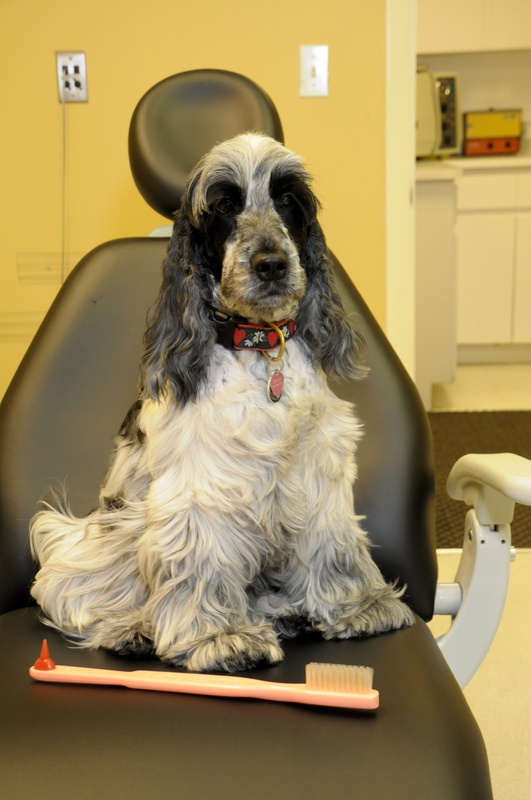 For sometime she expressed interest in wanting to improve the esthetics of the upper anterior teeth. 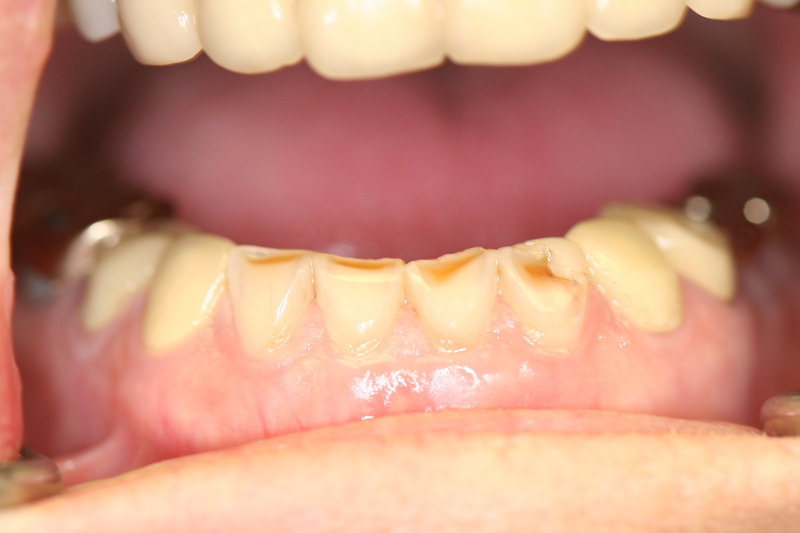 The teeth in the upper anterior are what is commonly referred to as the “esthetic zone”. As is evident from her smile, there are a multitude of challenges that present themselves, which will have to be addressed. The above picture does not reflect all the challenges; when the soft tissues of the cheeks are retracted it becomes much more evident as the picture just below reflects. Even to those less observant, there is an obvious size disparity that is clearly evident. 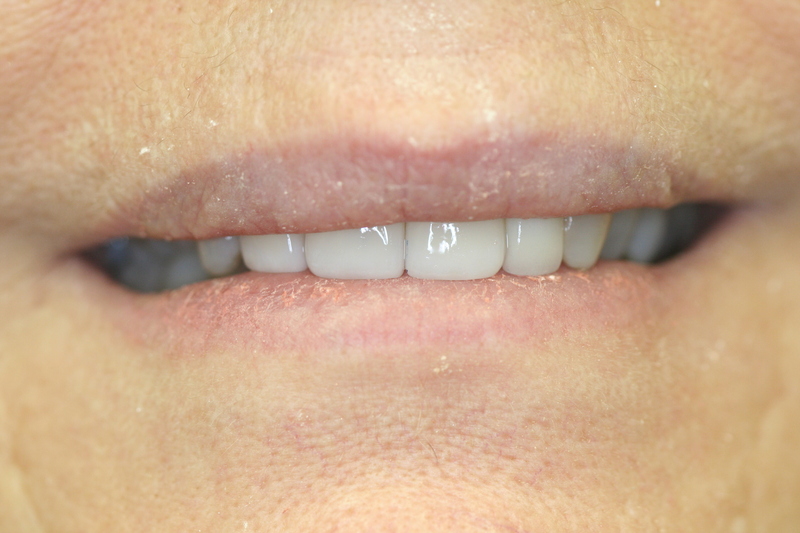 The lateral incisor on the upper left with the crown, displays a very long tooth. 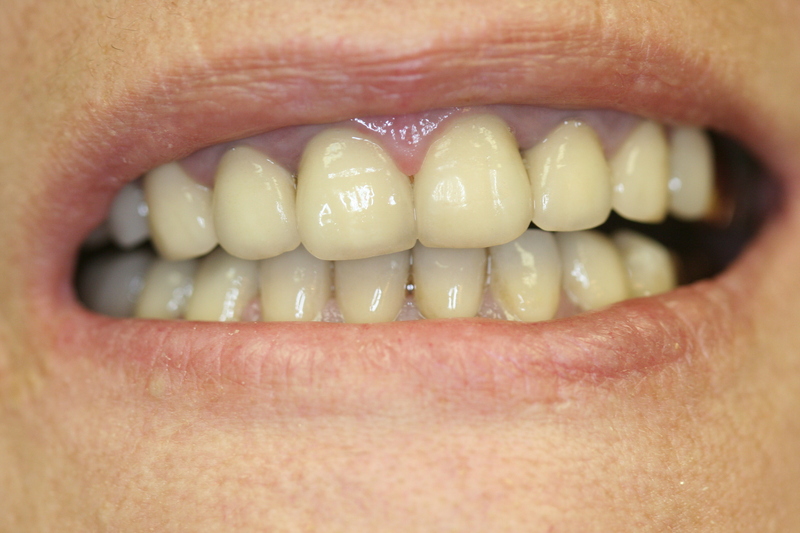 While the remaining three incisor teeth as a group are in a different size range. 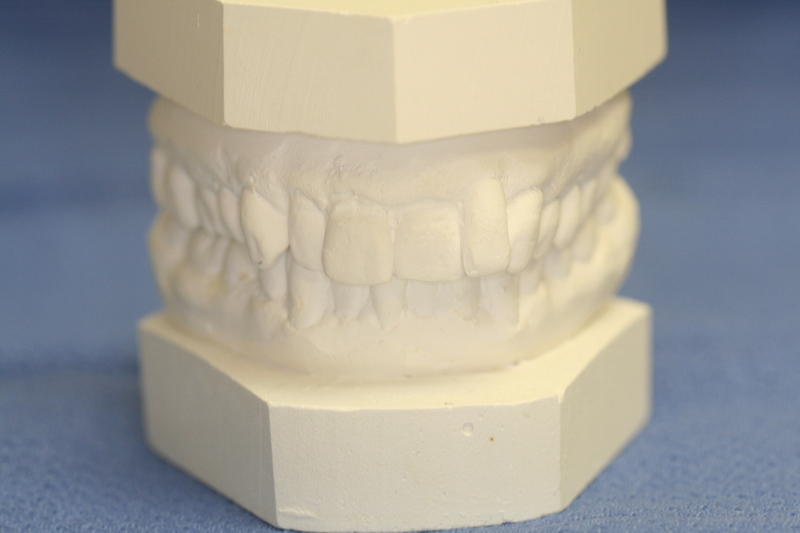 To give the patient contemplating this care a better perspective of what the final case will look like, impressions are taken of their dental arches. 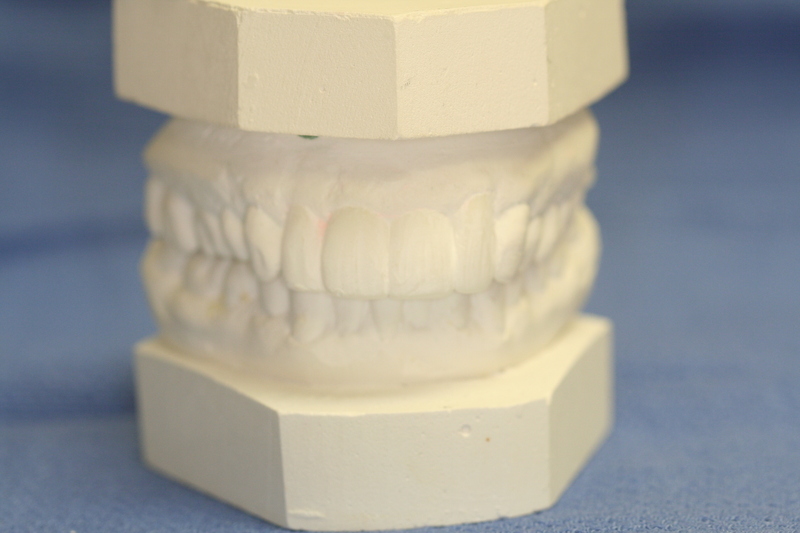 The models fabricated from those impressions shown below, were sent to the laboratory to wax up a “mock up” version of what the final case will look like before the cosmetic dental care is begun. The wax up version or “mock up” is shown below. Now the patient has an opportunity to get a rough idea of what the final treatment will look like. 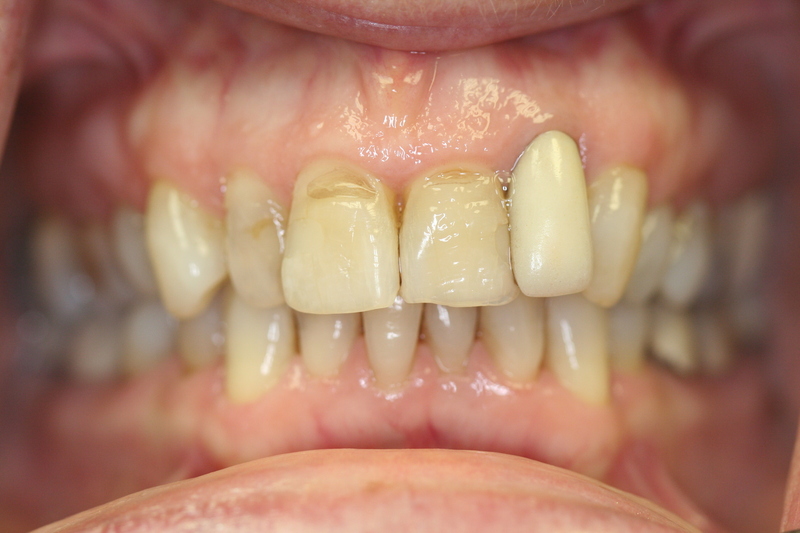 Initially our approach was to remove the crown on the left lateral incisor; the temporary crown as shown in the picture below was sized so it roughly equaled the size of the other three incisor teeth. This leaves a portion of the root of the tooth exposed. Also, what is not evident is that this tooth was treated with root canal therapy; it has a cast yellow gold post and core as well. A soft tissue graft procedure was then used to move soft tissue from the palate (donor site) to the neck of the tooth displaying the exposed root (recipient site). Following the graft procedure and 8-10 weeks of healing, the tissues presented as shown below. 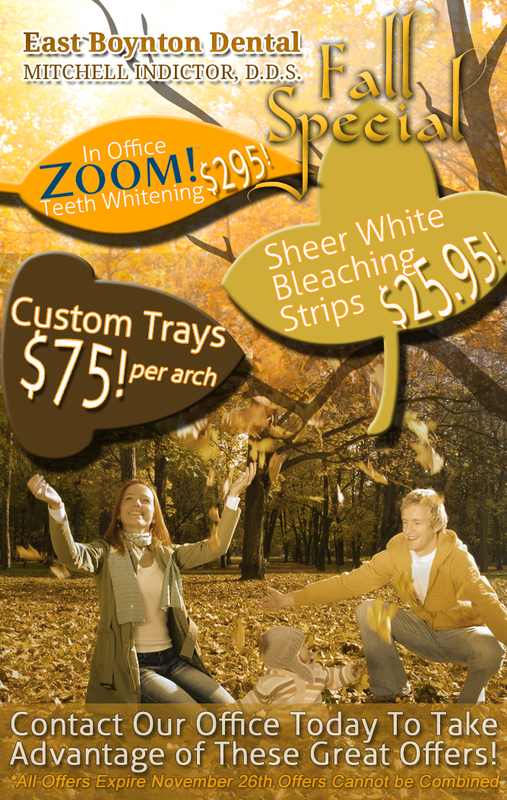 Now it becomes a straight porcelain bonded veneers and porcelain jacket crown case. 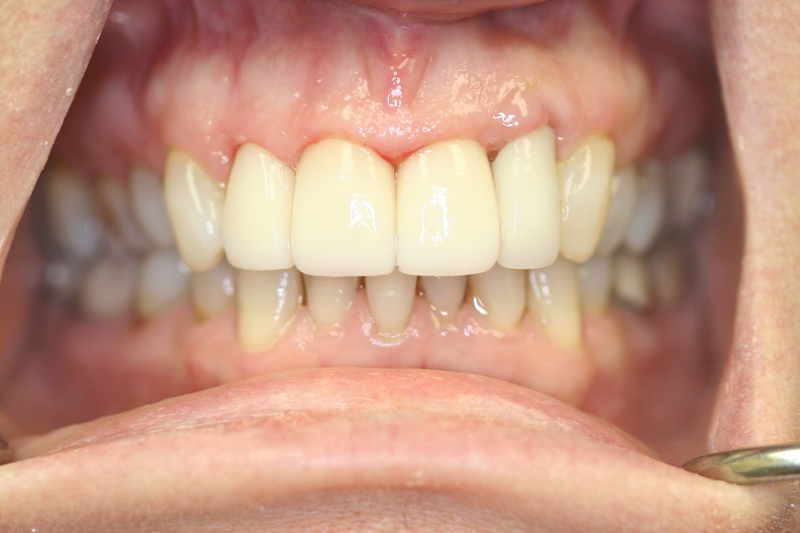 Below is the completed case following an in-office “Zoom” whitening of the teeth and the preparation, insertion and cementation of the bonded porcelain veneers and the porcelain jacket crown. 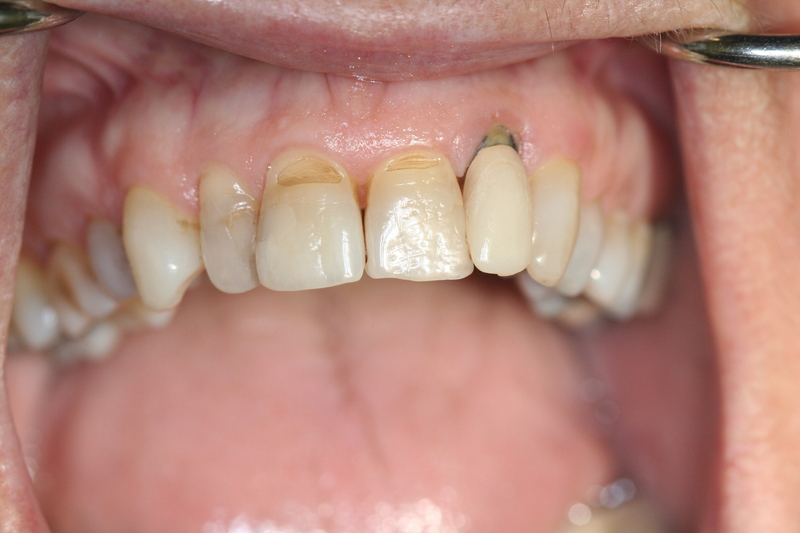 If you are interested in any aspect of this case and would like to discuss it further or any of the other cases that have been previously presented please feel free to contact us at eastboyntondental.com. 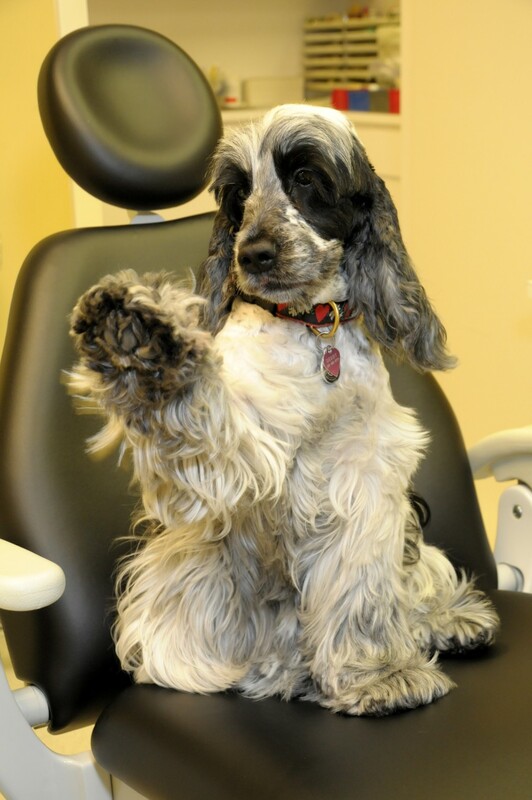 We’re always willing to discuss our dental care. 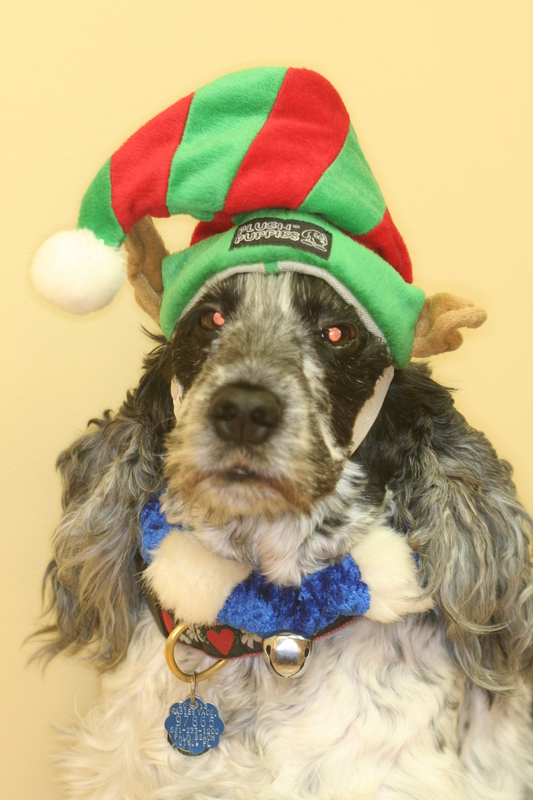 Happy Holidays from East Boynton Dental! With the holidays approaching, and the year winding down, Dr. Indictor and the entire staff at East Boynton Dental, including Derby, felt it a fitting time to express our sincerest “Thanks” to all those that have made this year special. We at East Boynton Dental, wish to express our best wishes for a Happy Holiday Season, and hope that the New Year brings you all good health and happiness always!